GEORGE TOWN, Grand Cayman — Marcquise Reed scored 24 points and Elijah Thomas turned in his second double-double in as many games to help lead No. 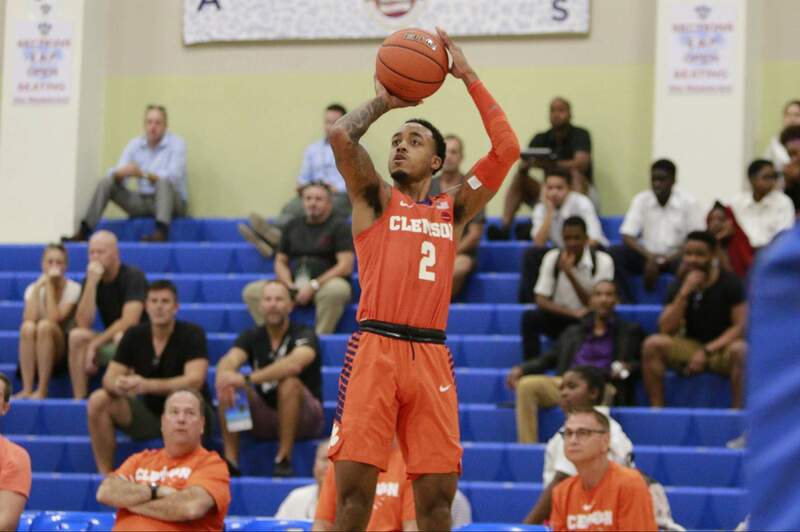 16 Clemson University men’s basketball past Georgia, 64-49, to advance to the Cayman Islands Classic championship game on Wednesday night. The Tigers (5-0) will advance to the championship game tomorrow night and will face either Georgia State or Creighton at 7:30 p.m. Clemson will have a chance to clinch its first regular season tournament championship since a Charleston Classic title in 2008. Reed led all scorers with 24 points on 9-for-19 shooting, narrowly missing a double-double with nine rebounds. He also tallied three assists and two steals in the contest. Down low, Thomas notched 12 points, 11 rebounds, one assist and two steals. Shelton Mitchell was the third Tiger in double-figures with 13 points and grabbed three rebounds and finished with two steals. Clemson took an eight-point lead into the locker room and it didn’t take long into the second stanza for the Tigers to push its lead to double-digits on the Bulldogs (3-2). The Tigers pushed its lead to a game-high 17 points at 59-42 with 5:08 to go in regulation. The last 11 minutes of regulation the Tigers only allowed nine points to the Bulldogs, improving head coach Brad Brownell’s record to 40-2 at Clemson when his team allows less than 50 points. The Tigers have won the last 21 of those contests. Notes: Clemson starts 5-0 for the second time under Brad Brownell … Clemson has now won seven-straight against the Southeastern Conference dating back to 2016-17 … Clemson is now 15-10 in regular season tournaments under Brad Brownell … Brad Brownell wins his 154th game at Clemson – leaving him three wins shy of passing Bill Foster for second all-time in program history … Marcquise Reed scored a team-high 24 points – his 27th career 20-point outing … Reed also grabbed nine rebounds – marking the 30th time in his career that he has collected at least five in a contest … Elijah Thomas notched his 13th career double-double, including the second in as many games this season … Thomas swatted one shot and now has 112 for his career – 14 shy of tying John Campbell (1977-80) for 10th all-time in program history … David Skara tied his career-high with three steals. Hey ppl in @theACC need to realize @ClemsonMBB is a veteran team with a winners mentality / they play solid TEAM D / held Georgia to 49 / yes won 64-49 as Tigers guards M REED & S MITCHELL r a tough duo .